To Cite: Eghbal F, Hoveida R, Siadat S A, Samavatyan H, Yarmohammadian M H. Identifying the Talent Management Components of Faculty Members, Strides Dev Med Educ. 2017 ; 14(2):e66895. doi: 10.5812/sdme.66895. Background: Since employing talent management as a system to identify, recruit, train, promote, and retain talented faculty members to optimize the capabilities of the university to achieve goals seems necessary, the current study aimed to identify the talent management components of faculty members. Methods: This qualitative study was conducted on the directors and faculty members of Isfahan University, Isfahan University of Medical Sciences, and Isfahan University of Technology, Iran. A purposive sampling method was used and semi-structured interviews conducted to collect data. All interviews were recorded, transcribed, and transferred to a computer using MAXQDA software. Following this, the data were coded, categorized, and interpreted, and then analyzed using a content analysis method. Results: After interviewing 18 university directors and faculty members, data pooling, data saturation, and data replication were performed. Accordingly, 107 codes were extracted from the obtained data and categorized into seven major classes. These were Defining and identifying talent needs, discovering talent sources, Attracting talents, Developing the potential abilities of talents, Strategically deploying talents, Retaining talents, and evaluation and alignment of talent management activities. Conclusions: Based on the results, 7 main classes and 20 subclasses of talent management components of faculty members were identified. These components are provided in a conceptual model. The evaluation and alignment of talent management activities are the main factors supporting talent management. Furthermore, dynamic coherence and integrity in identifying, discovering, attracting, developing, retaining, and effectively using talent, and the alignment of such features with the general strategy of the university were considered the strengths of the suggested conceptual model. Manpower has a specific position in organizations and is considered their main wealth. In knowledge - based organizations, particularly universities and higher education institutes wherein faculty membership is considered the primary source of manpower, this position is excellent, because faculty members perform the primary activities of such organizations. As such, the degree of their talent as the human capital of the university or higher education institute is important. Today, the world has entered a stage characterized by rapid and fundamental changes. In the current competitive situation and in an environment that frequently changes amidst continuous innovations, only organizations that understand the strategic role of human resources and benefit from professional, knowledge-oriented, competent, intelligent, and capable manpower can achieve success (1). In the current knowledge era, organizations focus on knowledge and knowledge - oriented staff. Under such circumstances, higher education has also undergone fundamental changes, making it significantly different from that of previous decades (2). Thus, the emergence of keywords such as talent management changed the pattern from traditional human resource management to modern human resource management, which includes paying more attention to organizational elites (3). The primary question is as follows: “What components should be considered to provide a comprehensive and effective model of talent management for faculty members?” First, the concept of talent management and its importance are investigated. The term talent management was first introduced by the consulting group Michaels et al. in a report entitled “The War for Talent” (4). The report emphasized talent management as vital to organizational success, because it provides competitive advantage through identifying, developing, and reordering talented staff. Since then, talent management has attracted increasing attention from researchers, managers, and those active in the organizational and management fields (4). Researchers believe that talent management was introduced to enhance human resource management to gain a competitive advantage and create potential ability (5). The chartered institute of personnel and development (CIPD) define talent as a complex set of skills, knowledge, perceptual abilities, and high potential, and talent management as identifying and emphasizing the potential of an organization (6). Primarily, talent management focuses on how people enter the organization and grow (7). In addition, it considers competence requirements and the way in which people act inside or outside the company (8). For effective management, the organization’s qualitative and quantitative needs in terms of talent are estimated based on its strategy and aims (9). Talent is obtained through the circulation of people in the organization and the way they enter it, develop their skills, and move up, down, or out of the company (10). A review of the literature in this field reveals no unified or integrated definition for talent management (11), which can be attributed to the different approaches to the concept. There are three positions or viewpoints regarding talent management. In the first, researchers consider talent as merely a title or new label for human resource management. In the second, the opposite position is taken, wherein talent management is not only a new label, but also an issue separate from human resource management. The third viewpoint is located between the first two. Here, talent management may employ the same tools as human resource management, but focuses on a small portion of staff, namely those identified as talented based on their current performance or potential. The third viewpoint emphasizes the identification of key posts in organizations. However, this does not apply to all posts, only those related to the organization’s competitive advantage (12-14). The current study adopts the third viewpoint, and as such, aims to enhance understanding of the components of talent management in universities. Various models developed by experts and theorists have been introduced in the talent management literature, wherein various components are considered the most important based on environmental or organizational requirements. However, no comprehensive model has been developed for talent management in universities. The five - factor model by Roper and Philips is a common model provided for the talent management process, which includes factors such as attraction, selection, involvement, development, improvement, protection, and the support and retention of staff (15). The talent management hierarchy model by Lewis and Heckman includes factors such as selection, recruitment, performance management, and service compensation (16). In addition, the Oehley model emphasizes attraction and recruitment, development, and retention (17). Finally, Armstrong’s model includes factors such as attraction, support and retention, and career development management (18). The model developed by Collings and Mellahi is a well - known talent management model in which key positions are introduced in the first step. Here, the organization’s mission, perspective, and strategy are first identified. Following this, knowledge, competences, and skills appropriate to key posts are defined, and finally, the talent source is created. The talent source can be supplied from manpower inside or outside the organization. Based on this model, the talent management process should be conducted under the architecture of human resources (19). Many studies emphasize the role of talent management in organizations (20-23), and others demonstrate the significant effect of talent management activities on organizational success (24, 25). Since talent management is important in higher education and acts as strategic capital, understanding the potential abilities and competences of faculty members and managing them to actualize these capabilities are among universities’ most important duties. Evidence indicates that universities that focus more attention on their human resources and employ talent management perform better than those that do not (26, 27). Talent management creates a mutual commitment between faculty members and the university by providing an appropriate environment, which improves the performance of staff and the organization. By identifying the abilities of faculty members and placing them in the right position, they are more satisfied and the university is able to achieve goals (28). In Iran, scant attention has focused on talent management in higher education, and few Persian books and papers on talent management in higher education are available. One outcome of the lack of studies in this regard is that talent management, particularly in higher education, is a new academic discipline with rapid quantitative and qualitative global developments. The gap between the status of the discipline in Iran and that worldwide necessitates further research in this regard. However, studies are lacking, and the effectiveness and value creation of talent management remain not well understood. The current study aimed to identify the components of talent management for faculty members and provide a model in this regard. The current qualitative study was performed to develop an applied model of talent management for faculty members. The statistical population constituted directors on different levels of the University of Isfahan, Isfahan University of Medical Sciences, and Isfahan University of Technology, Iran. These directors were aware of the objectives of the study and played a significant role in the process of attracting and recruiting faculty members to the executive and non - executive sections of the university in 2015. A purposive sampling method was used to select participants. The aim was to select and interview faculty members with managerial experience, particularly in talent management, who were willing to participate in the study. Sampling continued until data saturation was reached. Methods including asking colleagues and evaluations by faculty members were employed to assess the validity of the study. For this purpose, supervisors and advisors approved the results of data analysis and categorization. In addition, a researcher with adequate experience in qualitative investigations was asked to comment on the current study procedure. The researchers approved the study. To evaluate faculty members, the results of data analysis and codifications obtained from the interviews were provided to four interviewees for evaluation and confirmation. Details of the study procedure are explained (including sampling, data collection, and analysis) in the present paper. To improve the generalizability of the study results, a population that enables considering the issue from different aspects was selected. In addition, the sample size was increased until no new viewpoints emerged. provided to confirm the validity and reliability of the study. Qualitative data analysis was the most difficult and time-consuming part of the current study. Qualitative content analysis or thematic analysis was employed to analyze the data. Based on Krippendorff, the content analysis comprised data collection (recordings), data reduction, inference, and analysis (29). Interviews were completely recoded, transcribed, typed, and transferred into MAXQDA version 2007 to facilitate data codification. The author listened to the recordings several times before reading the transcriptions to extract emerging themes. Coding and categorizing began after the second interview. It helped the author to design useful questions and guide the interviews in line with the objectives of the study. The interviews were evaluated and meaningful sentences related to the main questions of the study marked. The basic concepts in the meaningful sentences were extracted as codes and transferred into the software, after which they were classified. Codes indicating similar concepts were categorized into the same classes. Classification and reviewing the classes continued until the author was satisfied with those formulated. Then, a name was allocated to each class based on themes. Note that the aforementioned practices were applied to all interviews. After each interview was evaluated, the classes were reviewed, integrated, or new ones created. At the end of the interviews, 20 subclasses including 107 codes extracted from the meaningful sentences were obtained. A sample of the procedure is shown in Table 1. In the next step, under the supervision of an observer experienced in qualitative data analysis, the classification and labeling of the classes were reviewed. Accordingly, redundant codes indicating similar concepts were removed and major classes merged into smaller subclasses and sub - subclasses. Some classes were integrated. The procedure of reviewing the creation and labeling of classes continued until the author was satisfied. Finally, a three - level categorical table was obtained. Talent development Increasing learning capacity in the university Education in IT Today, information technology is very important to universities and they should plan in such a way to enhance problem solving skills, the ability to innovate, welcome change, team work, managerial and leadership of people, as well as competencies associated with IT systems development. The qualitative data analysis culminated in extracting 224 primary codes that were reduced to 107 after several reviews and the integration of similar codes. They were then categorized in seven main classes as follows: identifying and determining talent requirements, discovering talent resources, talent attraction, developing potential abilities of talent, Attracting talents, and evaluation and alignment of talent management activities (Table 2). As shown in Table 1, respondents’ comments on identifying and determining talent requirements were categorized into three subscales. Most respondents believed that once directors understood their talent requirements, they could determine the general and specific competencies of faculty members needed to perform their tasks and realize the strategic goals of the university. Based on the comments of participants, competencies meant a set of skills, knowledge, and behaviors needed for effective role - playing. Furthermore, respondents believed that to determine the level of faculty members’ general competencies, the following factors should be considered: personal characteristics, emotional intelligence, verbal skills, behavior, novelty, idealism, learning ability, and rules observance. Respondents No. 15, 12, 9, and 4 further suggested features such as risk-taking, challenging, lack of obedience, courage, vigilance, high adaptability, hopefulness, and motivation as the personal characteristics of faculty members. Based on respondents’ comments (No. 2, 3, 4, 9), factors such as public relations, optimism, paying attention to what others say or want, the ability to convince others, persuasion, extraversion, and a high tolerance threshold should be included in the characteristics of emotional intelligence and verbal skills of faculty members. In addition, they added behaviors such as being hard working, patience, sensitivity, persistence, tirelessness, having a high morale, conscientiousness, being responsible and responsive, welcoming responsibility, loving to serve, staying away from hypocrisy and flattery, honesty and trustfulness, influencing university performance, being a work leader, and pragmatism (No. 4, 6, 9, 11, 12). Respondents No. 4, 5, 8, and 11 included the following factors in the novelty aspect of faculty members: being an entrepreneur, creative, inventor, explorer, curious, designer, innovative, thinking ability, transformative, lack of quotidian - type personality, and being reformist. Furthermore, to the aspect of idealism they added perfectionism, higher levels of expectations, successfulness, and faith in the principles of value (No. 4, 8, 9, 10). Based on respondents’ comments, the learning ability aspect should include factors such as intelligence, being a fast learner, learning from experiences and failures, welcoming new experiences, and continuous learning (No. 4, 7, 8, 14). Furthermore, being familiar with rules and regulations, being lawful, understanding the university and flexibility within the scope of the law should be included in the rules observance aspect for faculty members (No. 1, 4, 15, 16). Most respondents in this study noted that to determine the specific levels of competency for faculty members, some factors should be considered for the aspects of specialty, scientific - research records, and executive skills. In addition, they stated that for the aspect of specialty, factors such as higher education, specific knowledge and skills on education and training, computer literacy, and work experience were important (No. 4, 9, 10, 12). Respondents noted the following factors as important to cultural-scientific records of faculty members: cultural - scientific research records, interest in science, mastering the work, and having educational and teaching skills (No. 4, 13, 15). In addition, case - orientation, the ability to guide, time management, crisis management, organizational skills, programming ability, ability to solve discrepancies, guiding and leading skills, and problem - solving ability were considered important as the executive skills of faculty members (No. 4, 5, 7, 17). After Defining and identifying talent needs to meet the university’s strategic goals, respondents highlighted the most challenging factor as determining how the university can supply the required talent, also referred to as discovering talent resources. In other words, discovering talent is to identify talent resources to implement the general strategy of the organization most efficiently. The factors noted by the study respondents based on their experiences and viewpoints were categorized into the following three subclasses. This refers to the continuous development of the knowledge, skills, and behaviors of a person or group of personnel to improve the general capabilities of the university. The features mentioned by the study respondents based on their experiences and viewpoints were categorized into three subclasses. Respondents agreed that investments would be appropriate and effective if learning and development programs were designed and implemented based on the gap between particular qualifications and skills and the developmental requirements of faculty members. According to a comment by respondent No. 4, “Here, the most important case is the type of learning programs a faculty member needs.” Respondents contend that the development of faculty members should focus on professional and individual development approaches (No. 4, 9, 13, 17). They also suggested emphasizing the following factors in professional development: improvement of learning, research, technical and interpersonal skills, and specifically, the ability to foster effective relationships with students. In addition, some respondents (No. 1, 2, 4, 13) highlighted the following factors in the individual development of faculty members: programming to develop their internal capacities (e.g., learning, thinking, communication, and implementation capacities), enhancing professional ethics, creativity, risk-taking, and innovation, quality of working life, and job commitment. Evaluation is an important feature of high - performance learning organizations. As such, respondent No. 11 stated, “To evaluate the implemented programs, the simplest method is usually unfortunately employed, which concentrates on the number of participants’ training programs, training hours, and satisfaction with the programs.” For respondents, the purpose of investing in learning and promoting skills and competencies is to enhance performance. Therefore, it is recommended to focus on evaluating learning effectiveness and the results and outcomes thereof (No. 1, 6, 7). This capability deals with the placement of talent in appropriate positions at the right time to empower the organization in effectively implementing strategies to deal with challenges and harness future opportunities. Based on their experiences and viewpoints, the components identified by respondents were categorized into two subclasses. Some respondents (No. 4, 12) noted that Talent - Powered universities employ methods to better synchronize and align talent from inside and outside in locations (positions, roles, units, etc.) where they are most needed or best fit the position. Accordingly, they enable talented personnel to perform their tasks and equip them to deal with future challenges. The components raised in this regard by the study respondents are based on their experiences and viewpoints and categorized in five subclasses. Some respondents (No. 2, 4, 5, 11, 12) indicated that the research atmosphere of the university including being innovative and progressive, scientific and academic freedom, providing appropriate time and opportunities to conduct research, honoring research achievements, and providing research facilities and support affect the retention of faculty members. Some respondents (No. 4, 6, 9) considered that the atmosphere for teaching and education at the university including educational and teaching facilities, honoring successful teaching, and providing educational support influence the retention of faculty members. The study respondents contended that occasions for personal and professional growth and development; colleagues’ motivation and dynamics; job security; fair salaries, benefits, and rewards; work - life balance; the competency of the management team, and university and faculty personnel affect the retention of faculty members (No. 4, 9, 16). The evaluation and alignment of talent management activities is the most supportive factor in the talent management cycle or procedure. The talent management procedure enables dynamic coherence and integration to identify and determine the talent needed, as well as to discover, develop, and effectively use talent and align these actions with the general strategy of the organization. The components mentioned by respondents, which are based on their experiences and viewpoints, were categorized into two subclasses. According to respondents, consolidating all procedures associated with talent management and developing and adopting a systemic and holistic approach are necessary. Some respondents added that the “use of a competency framework to integrate different components of the talent cycle is essential” (No. 4, 9, 12). Based on the comments of respondents, evaluating faculty members’ performance based on designated performance indices and comparing the results to those of previous evaluations can provide useful data on the alignment of talent management activities (No. 4, 6, 9, 10). Some respondents note that the evaluation of teaching, research, creativity, and innovative activities, as well as professional and specific services provided by faculty members provides useful information on the alignment of talent management activities (No. 2, 15, 16, 17). The study respondents mentioned that evaluating faculty members’ satisfaction with their jobs and the university, the rates of their service resignation and job transfers, commitment to the university, average length of employment, and total number of days allocated to their education and development can also provide useful data on the alignment of talent management activities (No. 2, 15, 16, 17). The current study aimed to identify the components of talent management of faculty members. In this study, based on the comments of managers and faculty members, 7 main classes and 20 subclasses were formulated for the talent management components. Furthermore, the results of the study indicate that the items mentioned by faculty members were proportional to the talent management procedure. Other studies on talent management models indicated components similar to those found in this study, although some factors that emerged in this research did not arise in other available references or were not mentioned as frequently. In other cases, they were integrated with other components. According to Phillips and Poper, the talent management procedure includes attracting, selecting, involving, developing and improving, and retaining staff (15). However, Lewis and Heckman maintain that the procedure implies identifying available potential, evaluating their readiness, developing talent, selecting and employing talented people, and finally, emphasizing their performance (16). In his thesis, Oehley focused on the talent management procedure, analyzing and identifying the status of human resources. He concluded by elaborating how to attract, develop, and retain talented people (17). Armstrong developed a model of talent management and emphasized talent attraction, talent retention, and talent development activities as associated procedures (18). Based on the idea of Collings and Mellahi for talent management, it is important to determine the organization’s key posts, and then to define the knowledge, competencies, and skills appropriate to these posts. Finally, talent resources should be created (19). The results of the aforementioned studies concurred with some of the results of the current study, although they are inconsistent with others (15-19). Deeper focus on the evaluated studies indicated that components such as attraction, development, and retention were highlighted, while selection and employment of resources were discussed only in some research. Moreover, the components of identifying and defining required talent as well as the evaluation and alignment of managerial activities were the main classes formulated in the current study. Noteworthy is that the class “discovering talented people” and its subclasses of talent supply chain management, determining the approach to discovering talented people (sourcing), and evaluating talent sourcing options are discussed in more detail in this study than others. Based on their high importance, they were classified in a different area. The formulation of this new class, namely discovering talented people, is attributed to the interest of the study respondents in discussing modern talent sourcing methods. Based on the results of this study, the first step towards Talent - Powered universities is to determine the quantity and quality of the talented people required for effective implementation. Therefore, university directors should clearly understand the particular combination of knowledge, skills, and attitudes required for the university currently and in the future to determine both the general and specific competencies of faculty members needed to complete their tasks and achieve the university’s strategic goals. In the second step, based on the comments of the respondents in this study, discovering and identifying talent resources relies on evaluating and assessing all possible options to recruit talented people and finding the best method to attract talented faculty members. To meet these goals, talented students of the university and the issue of succession should be a key area of focus. Most respondents considered talent attraction (the third step) to have the greatest impact on the performance of faculty members. They also noted that in the talent attraction process, universities should evaluate applicants’ information skills such as fluency in English; ability to use information technologies; adaptability skills such as fluency in new skills; personal characteristics including courage, vigilance, and risk - taking; and behavioral features such as being hard working, patience, responsiveness, adherence to rules and regulations, and being lawful. They added that to attract the most talented applicants, their specialized knowledge should be evaluated through structured interviews conducted with experts and their professional work experience assessed based on predetermined criteria. Most respondents discussed the development of faculty members. The results of the study highlighted professional development as the first step in making improvements. In other words, professional improvement focuses on what faculty members are expected to do in an academic environment. The following factors were indicated for this dimension: improvement in teaching, education, research, providing services, technology, writing, and interpersonal skills (14). In addition, the current study showed that the improvement of faculty members is significant in the innovation and promotion of academic excellence. Therefore, improving the performance of faculty members and the university can be achieved by developing faculty members’ talents and their educational, research, communication, technology, and work ethic, as well as by providing them with opportunities for sabbaticals and to participate in workshops and international training seminars. Based on the results of this study, in the stage of the strategic employment of faculty members, if university managers and directors effectively complete the later stages, they can focus on the appropriateness of work contents and capabilities as well as the interests of faculty members. This would enable them to benefit from the capabilities and skills of the faculty members recruited in educational or executive departments considering their competencies. The results of this study showed that the component of the evaluation and alignment of talent management activities is the most important supportive agent in the talent management cycle or procedure. This component is neglected in similar studies. However, if the components of the talent management procedure including identification, attraction, employment, development, and retention are not coordinated with the general strategy of the university, the effective management and development of faculty members will not occur. Therefore, it is recommended that university directors develop a comprehensive evaluation system to analyze the strengths and weaknesses of the talent management procedure. Noteworthy is that similar national and international studies emphasize only part of the issue, and in the best case, only consider minor components of the talent management procedure, focusing on the definition and importance of the components. As such, indices of each component are considered. The authors tried to consider all dimensions of the talent management procedure for faculty members, who occupy a key position in the university. Based on the results of the current study, Figure 1 illustrates a model of talent management for university faculty members. The suggested model indicates that talent management should be performed under the architecture of human resources, although the creation of a Talent - Powered culture and attitude in the university is an important matter that should be considered before implementing talent management processes. A Talent - Powered attitude is based on two common beliefs. First, people agree on the importance of talent in their and the university’s current and future needs, and that talent is a distinctive feature. Second, university managers and faculty members believe that they can personally increase the level of talent available to the university. Based on these two beliefs, universities can foster a Talent - Powered attitude. In the talent management model suggested in the current study, the procedure begins with powerful and inspiring leadership, a clear indication of strategies, and a profound belief in the strategic value of talent that emerges as a Talent - Powered attitude and culture. 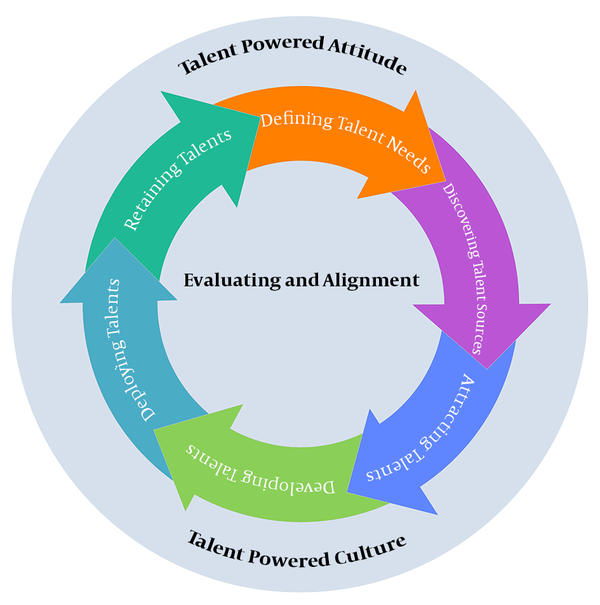 When the key components of talent management (defining and identifying talent needs, discovering talent resources, talent attraction, talent development, strategic employment of talent, and talent retention) are linked with the general strategy and aligned to all procedures and activities, universities can activate the cycle of talent replication and promote the knowledge, skills, competencies, and commitment of employees to improve performance. Under such circumstances, the evaluation system is important, as it empowers the university to understand the strengths and weaknesses of all talent management components, investment needs, and how to direct values and achieve results. The suggested model helps managers in many ways. Rather than repeating the role of human resource management, managers can provide a copy of the required competencies of successful faculty members who occupy a key position in the university. Then, managers can attempt a new orientation towards human resources regarding Defining and identifying talent needs and discovering, attracting, developing, evaluating, and retaining valuable human capital to deal with challenges and meet newly emerging needs. As in all other studies, the current one had some limitations. However, these limitations provide new avenues for further research. Based on the low number of similar studies and the novelty of the issue of talent management in Iran, more attention is needed on localizing the applied talent management model in further studies. In addition, it is recommended that future studies follow up on and evaluate the efficacy of the applied model designed in this research. Hereby, the authors wish to thank all respondents and individuals who helped them in the study. 1. Armstrong M. strategic human resource management: A guide to Action. London and Philadelphia: Kogan; 2006. 2. Daigle SL, Jarmon CG. Building The Campus Infrastructure That Really Counts. Educ Rev. 2007;32(4):35-8. 3. Scullion H, Collings DG, Caligiuri P. Global talent management. J World Bus. 2010;45(2):105-8. doi: 10.1016/j.jwb.2009.09.011. 4. Michaels E, Handfield-Jones H, Axelrod B. War for Talent (Hardcover). Boston: Harvard Business School Press Books; 2001. 5. Sandler SF, Patterson P, Prescott J, Shaw M, Kelly L, Allikas D, et al. Critical issues in HR drive 2006 priorities:# 1 is Talent Management. HR Focus. 2006;83(1):1. 6. CIPD . Talent management, Research Insight, June. London; 2012. 7. Duttagupta R, Tian B, Wilusz CJ, Khounh DT, Soteropoulos P, Ouyang M, et al. Global analysis of Pub1p targets reveals a coordinate control of gene expression through modulation of binding and stability. Mol Cell Biol. 2005;25(13):5499-513. doi: 10.1128/MCB.25.13.5499-5513.2005. [PubMed: 15964806]. 8. Gagne F. Ten Commandments for Academic Talent Development. Gifted Child Quarterly. 2016;51(2):93-118. doi: 10.1177/0016986206296660. 9. Cappelli P. Talent management for the twenty-first century. Harv Bus Rev. 2008;86(3):74-81. 133. [PubMed: 18411966]. 10. Schweyer S, Soruri A, Meschter O, Heintze A, Zschunke F, Miosge N, et al. Cisplatin-induced apoptosis in human malignant testicular germ cell lines depends on MEK/ERK activation. Br J Cancer. 2004;91(3):589-98. doi: 10.1038/sj.bjc.6601919. [PubMed: 15266324]. 11. Iles P, Chuai X, Preece D. Talent Management and HRM in Multinational companies in Beijing: Definitions, differences and drivers. J World Bus. 2010;45(2):179-89. doi: 10.1016/j.jwb.2009.09.014. 12. Walker JW, LaRocco JM. Talent pools: The best and the rest (Perspectives). Human Resource Planning. 2002;25(3):12-5. 13. Zhang JZ, Creelman RA, Zhu JK. From laboratory to field. Using information from Arabidopsis to engineer salt, cold, and drought tolerance in crops. Plant Physiol. 2004;135(2):615-21. doi: 10.1104/pp.104.040295. [PubMed: 15173567]. 14. Barlow L. Talent development: the new imperative?. Dev Learn Org Int J. 2006;20(3):6-9. 15. Phillips DR, Haynes BP, Roper KO. A framework for talent management in real estate. J Corp R Estate. 2009;11(1):7-16. doi: 10.1108/14630010910940525. 16. Lewis RE, Heckman RJ. Talent management: A critical review. Hum Resource Manag Rev. 2006;16(2):139-54. doi: 10.1016/j.hrmr.2006.03.001. 17. Oehley AM. The development and evaluation of a partial talent management competency model. Stellenbosch: University of Stellenbosch; 2007. 18. Armstrong M. Human resource management practice. London: KoganPage; 1999. 19. Collings DG, Mellahi K. Strategic talent management: A review and research agenda. Hum Resource Manag Rev. 2009;19(4):304-13. doi: 10.1016/j.hrmr.2009.04.001. 20. Tarique I, Schuler RS. Global talent management: Literature review, integrative framework, and suggestions for further research. J World Bus. 2010;45(2):122-33. doi: 10.1016/j.jwb.2009.09.019. 21. Lepak DP, Snell SA. Examining the Human Resource Architecture: The Relationships Among Human Capital, Employment, and Human Resource Configurations. J Manage. 2016;28(4):517-43. doi: 10.1177/014920630202800403. 22. Ashton C, Morton L. Managing talent for competitive advantage: Taking a systemic approach to talent management. Strategic HR Review. 2005;4(5):28-31. doi: 10.1108/14754390580000819. 23. Langenegger PB, Mahler P, Staffelbach B. Effectiveness of talent management strategies. Eur J Int Manag. 2011;5(5):524. doi: 10.1504/ejim.2011.042177. 24. Bhatnagar J, Budhwar PS. Talent management strategy of employee engagement in Indian ITES employees: key to retention. Employee Relat. 2007;29(6):640-63. doi: 10.1108/01425450710826122. 25. Garrow V, Hirsh W. Talent Management: Issues of Focus and Fit. Publ Person Manag. 2008;37(4):389-402. doi: 10.1177/009102600803700402. 26. Fives H, Looney L. College Instructors' Sense of Teaching and Collective Efficacy. International J Teaching and Learning in Higher education. 2009;20(2):182-91. 27. Bartram D. The Great Eight competencies: a criterion-centric approach to validation. J Appl Psychol. 2005;90(6):1185-203. doi: 10.1037/0021-9010.90.6.1185. [PubMed: 16316273]. 28. Berger LA, Berger DR. The talent management handbook: Creating organizational excellence through identifying developing and positioning your best people. New York: McGraw-Hill; 2004. p. 3-21. 29. Krippendorff K. Content Analysis: An Introduction to Its Methodology. London: Sage Pub; 2004.